Torn Rotator Cuff: Should You Fix It? Is Surgery Necessary for a Torn Rotator Cuff? Many of our patients come see us here with a rotator cuff tear. 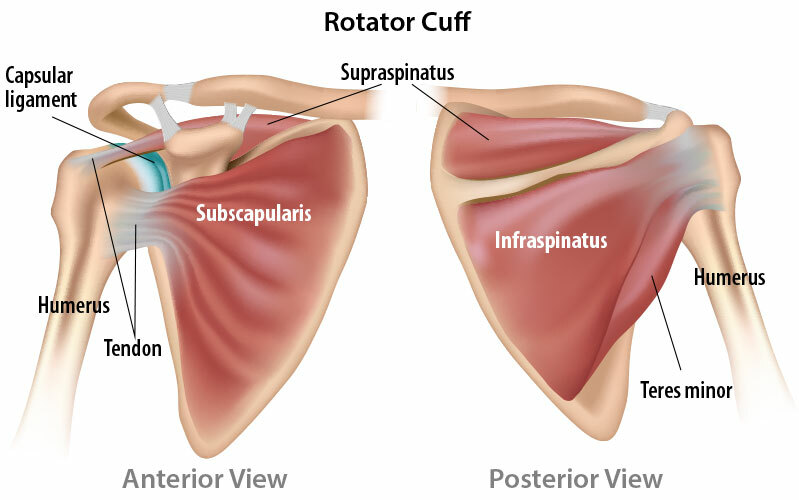 Rotator cuff tears do not discriminate – they are in men, women, active and non-active. A 2009 paper in the Journal of Shoulder and Elbow Surgery found that roughly 21% of the general population has a rotator cuff tear and another paper showed that by the age of 60, 30% of people have at least a partial rotator cuff tear. Rotator cuff tears in athletes have been reported to be anywhere from 13-37% with throwers having up to 40% rotator cuff tear incidence. Given that the revision rate with rotator cuff tears has been found to be as high as 50+%, it begs the question, should you get your torn rotator cuff repaired? 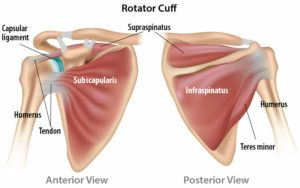 Intuitively, most folks say that the rotator cuff’s role is to “rotate” the arm. While that is true, the two main goals of the rotator cuff are to compress the humeral head and depress the humeral head. Effectively, it “steers” the shoulder. If you think of a golf ball spinning on a tee, that is similar to what the rotator cuff does – it keeps the ball of the shoulder (humeral head) on the tee (glenoid fossa). A torn rotator cuff will not allow normal mechanics to occur which usually leads to pain and dysfunction. There are basically three mechanisms as to how rotator cuffs tear. The first is through trauma. Falling on an outstretched hand or landing directly on the shoulder are just two examples of how trauma can cause a tear. The second is from repetitive activity – years of throwing or overhead sports and lifting weights for example – lead to a tear. Finally, rotator cuff tears are degenerative. In essense, this is just “tread on the tires.” From years of repetitive use, the rotator cuff just starts to break down. So should I fix my torn rotator cuff? There are many factors to consider when deciding if you should fix your torn rotator cuff. First and foremost, pain and function should be considered. If you’re having a fair amount of pain and can’t use your shoulder for much, you might consider a rotator cuff repair after talking with an orthopedic surgeon. Certainly a steroid shot is an option, but it’s not likely a long-term solution – it may help your pain, but it’s not going to “fix” the tear. If you aren’t able to do the things you enjoy due to shoulder pain or lack of mobility and/or strength, you’re potentially a good candidate for surgery. That being said though, prior to even thinking about surgery, you should give rehab a fair shot. You may be saying “of course, you’re PT’s so you want me to try rehab first.” Well, why not give rehab a dedicated 4-6 weeks of work before making your decision? Why get cut when you may not have to? If you don’t lead a very active lifestyle and just want to do your job and do light to moderate housework, you may do fine with rehab. Second, consider if it’s your dominant or non-dominant arm. If your cuff tear is in your non-dominant arm and you’re not in too much pain but more occasional discomfort, you might consider going the non-operative route. Next, you should think about if your shoulder has other pathology in it. Years of wear and tear from just living life may lead to a shoulder with arthritic or other degenerative changes in it. Adding repair to those pathologies to a rotator cuff tear may prolong rehab and may not get you the outcome you desire. Fourth, you should think about if you’ll have enough time to devote to the rehabilitation after surgery. The first 6 weeks after repair are critical for healing to take place, and even 12 weeks after surgery, the rotator cuff is only 50% of its tensile strength. Rehab can take anywhere from 6 months to a year to do it right. Are you willing to put off golf for the summer? Are you going to listen to the post-operative restrictions and not get back in the swimming pool or tennis court too fast? Does your job allow you modifications or desk work until you are able to resume normal work activities? All of those things should be considered because if you don’t fully commit to the rehab, it will fail. Next, you should think about if there are any activity modifications you can make. For example, let’s say you play tennis 3-4 days a week. Maybe it’s just the volume of tennis that makes you hurt, not the tennis itself. Let’s face it, you’re older body isn’t what it was in your college years. So, what if you only played two days a week and cross-trained with another activity? By taking this approach, you’re “meeting your body where it’s at.” In our experience as physical therapists, this has been very effective to find that “sweet spot” of being able to scratch the itch playing the sport you love, but not being miserable all week either after doing so. The last thing to think about is the size of the tear and the quality of the tissue. You would have to find that out from your doctor though. A really small tear with good quality tissue may do quite well with rehab. However, a large tear with might be better off with a repair if you also have high pain and dysfunction. All things being considered above, the decision fix versus not to fix really comes down to pain levels and shoulder function as well as your desired activity level. A discussion with a physical therapist as well as an orthopedic surgeon should help you make the most informed decision. If you have a torn rotator cuff, look no further than the physical therapists at SSOR to help you. We see these regularly and know exactly what needs to be done to reduce pain and improve your function. Plus, we won’t waste your time – if we see that rehab just isn’t working after a few visits, we’ll send you to the doctor to consider surgery or other interventions. It would be a privilege to partner with you in your care. Give us a call!